Yesterday my email subscribers list touched 10,000+. Email subscribers only not those who have done my course. This is just too much. I know very well that a lot of people DO NOT read my emails and just press the delete button or do not open them to read. It is quite obvious that there is no point in sending emails to these people as they are not interested. So I logged in my account and searched for those subscribers who did not read or did not open a single email since my last 50 emails sent to them. To my surprise there were more than 3000 people who did not open even a single email of these last 50 emails sent to them. Why should I keep them in my list and pay the price for it? Isn’t it wasting money for no reason? Therefore it did not take me even a second to decide I will delete these emails from my list. And of course I pressed the delete button. Do not worry if you are reading this email you are still in the list and will keep getting my emails. The reason is simple you read my emails. Thanks a lot for that. Still the price to keep these 7,000 emails is around Rs. 4,000/- per month but I cannot delete emails of those people who read my emails. I request you to keep reading my emails else to save costs I have no option but to delete your email. Hope you understand that what I have done is correct. Also if you have subscribed to receive my newsletters from two or more emails I suggest unsubscribe from that email which you do not open as it costs me a lot to keep them in list and you still get my email on the one you read. There is no point in subscribing from two emails to receive the same email. Thanks a lot. Please like it and share it. A note for those who are my email subscriber since last 6 months or more and are still planning to do my course. If you are making good money great, congratulations. But if you are losing money trading what is stopping you to do my course? Do you think making 3% a month is not better than losing money? Or do you think 3% a month is less? Imagine the time you have wasted, frustration you go have gone through all these months or years and money you have lost just to save Rs.5000 on my course fee. Is it really justified? There is a lot to learn in the course. Please understand that its only knowledge, hard work and experience that makes money. Speculations in any business except lottery buying does not make money. Stock trading is also a business. Just because you have a trading account does not mean you will make money – its only those who are trading wisely make money not speculators. In fact wise traders must be thanking you every day because you are gifting them your hard earned money. Someone has to lose for someone to win. But the decision is entirely yours. You have already lost a lot of time and lot of money and still if you think suddenly you will start making money, I ask you a simple question – HOW and from WHEN? To become a great footballer or cricketer you have to get good training isn’t it? Otherwise how you will ever learn the game? The same rules apply in businesses as well, even in stock trading business. Here are the details of my course. 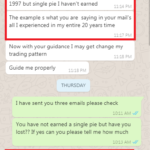 And here are real testimonials from over 100 clients who are making money trading my strategies and the best part is they are also happy trading these conservative strategies. Once you know the losses are capped you will obviously not fear trading these strategies isn’t it? You can pay here online in less than 1 minute. Please remember that you can do this course from your home there is absolutely no need to meet me as the course is done through emails. Now the choice is yours.